At Marquette High School located in Alton, Illinois, engineering teacher Michele Sands had her class draw straws as a way for students to randomly form teams for the SourceAmerica Design Challenge. 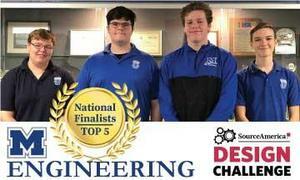 Student Evan Hendricks became the team leader for team Blue Crew Engineering, joined by classmates Will Dixon, Joseph Grabowski and Elizabeth Wurth. The Blue Crew Engineering team collaborated with Challenge Unlimited, Inc., a SourceAmerica member nonprofit dedicated to providing opportunities for people with disabilities. According to Sands, what's unique about this particular team is that they spent most of their time working on a completely separate project, which they had to scrap when they figured out their preferred material wouldn't work. Sands added, "The team had to start over, which was a huge hurdle. They had to go back to the nonprofit, observe and work with a new subject matter expert and create a whole new device or system. It is amazing that as a first time school, one of our three teams, the Blue Crew, landed in the top five across the nation." Despite the fact that the team was randomly formed, the students discovered each other's strengths and leveraged them for the good of the team project. Challenge Unlimited, Inc. employee Don Lucas was the subject matter expert for the team's final submission. The goal was to create a device that would help Don package boxes of shotgun shells. He needed to increase his speed and make the boxes error-free. "We had about eight weeks to research, design and create a solution, and went through about five prototypes until we reached our final product," said Hendricks. "It was really rewarding to see Don nod and smile as he used the device. What was even more exciting is when we witnessed Don realize that he made a mistake and correct it on his own." The MCHS Blue Crew Engineering team created a device called the Shell Shover. The Shell Shover guides employees with disabilities with placement and orientation of ammunition. It is color-coded and has holes of differing sizes to help them place shells properly into the device, and in turn, pack them correctly into the box. By eliminating the need to cognitively track the proper orientation and minimizing the fine motor skills needed, employees that used the device decreased packaging errors and increased their speed. The Shell Shover was so useful to Don that Challenge Unlimited, Inc. requested 20 more of the device. Thanks to the students' device, many other employees in the company can now do the job. When the Blue Crew Engineering team enters the room, Don's eyes light up and he enjoys talking to the students. "Watching the team beam with delight as they watch Don work the Shell Shover is something I will always cherish," said Sands. "It was a joy to watch the team develop genuine care and concern for Don and how they could help him. The team is so proud of Don and what they accomplished—the Design Challenge was such a wonderful experience and opportunity."